Reading: Ithaca by David Davidar. I know it received some bad reviews, but I still had to read it after all that had happened. Satisfactory so far. If you want slick, fast-paced Lisbeth Salander type action, avoid. Watching: 2 Days In Paris. HILARIOUS. A quirky, neurotic couple spends (obviously) two days in Paris as they sort out their relationship. Starring Julie Delpy (Before Sunrise) and Adam Goldberg (you will recognize him as Chandler Bing’s eccentric roommate Eddie.) Must watch, you are guaranteed to laugh! And the nice part is, that while the movie is set in Paris, the city does not consume the film. It’s more about the crazy characters and what they experience. For foodies, there are some interesting scenes involving rabbit stew and a trip to the market. Wearing: Crabtree & Evelyn Nantucket Briar EDT. I remember my dad gifting me a little Nantucket basket when I was around 10, and it felt like some kind of rite of passage into tweendom. I received this one as a gift as well, and adore the scent- elegant and soft. 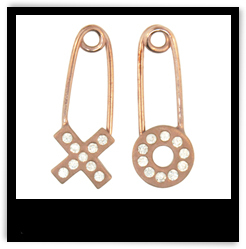 Loving: These Genevieve Jones xo earrings. Just adorable! Need I say more? Have a great weekend, everyone! And since x’s and o’s are clearly in style, I shall say goodbye with them. xoxo. Oh well. By the time I hit ‘publish’ it was Saturday. But you understand. Love your blog! 😉 Very enjoyable to read! Anastasia, you have me grinning from ear to ear. Thank you so much! Thanks for sharing this! Going to check out that film…am a fan of Before Sunrise/Before Sunset so this looks good too! Great idea, I should think up a travel less thursday! But what will I say? LOL!! Maybe you could post pictures of the stuff you design(ed)? Anita…THANK YOU!! You flatter me. You really do!! I greatly admire your fiction and photography skills 🙂 So sad the book didn’t reach on time! Normally flipkart is prompt with these things- even the imported editions. I like that one too! My favourite is So Nice So Smart. It’s so cute! Thanks, sporty! Hope you had a good one as well.